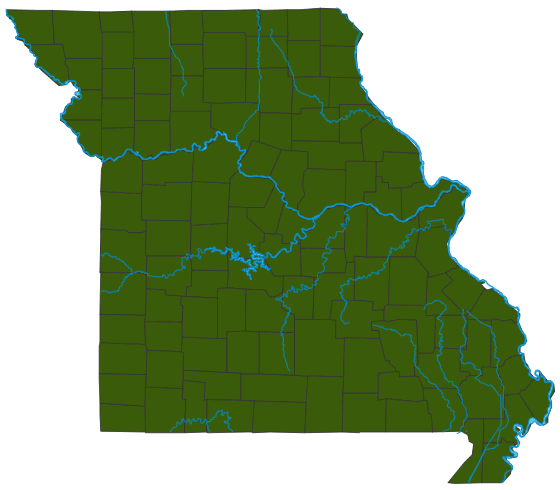 Daddy longlegs, or harvestmen, are familiar Missouri animals. They are not spiders, but opilionids. Unlike spiders, they have a fused body form and lack silk and venom glands. Most of us are familiar with the common, harmless, spiderlike “harvestman,” with its remarkably long, wiggly legs. We can easily see differences between harvestmen and spiders. The body is a simple oval, and it’s usually hard to tell where the “head” ends and the segmented “abdomen” begins. They also lack silk and venom glands, and they only have two eyes. Lacking silk glands, they never build webs. They lack venom, but they emit a weird odor when disturbed. Their chelicerae (mouthparts) are too small to bite people. Sometimes there are tiny yellow, orange, or red blobs stuck on the body or legs: These are mites parasitizing the harvestman. Similar species: Long-legged cellar spiders (in the spider family Pholcidae) are sometimes called “daddy longlegs,” but they are definitely spiders: They weave cluttery-looking, irregular webs in the upper corners of basements, caves, and similar places and clearly have two distinct body regions: an oval abdomen plus a rounded head. They are generally much smaller and more delicate, too. Body length: to about ½ inch (does not include legs). In harvestmen, the body is a simple oval, and it’s usually hard to tell where the “head” ends and the segmented “abdomen” begins. Members of the armored harvestman suborder typically have rather short legs and live on the ground under rocks, logs, and leaf litter. They are predators. Daddy longlegs can be found as they explore a variety of habitats, often among leaf litter on the forest floor or on the bark of trees. They are mostly nocturnal, but many are active in daylight. They sometimes gather in large groups, especially when it’s dry, apparently to minimize water loss. At least four species of daddy longlegs have been found living in Missouri caves, where they cluster in dark, moist places near the cave entrance. Harvestmen are omnivores, eating a variety of organic material, or scavengers, feeding on feces or carrion, but some are predatory on aphids and other small insects. Unlike spiders, they do not eat via a strawlike sucking of liquids; instead, they ingest small chunks of solid material. They often feed at night. Their vision is generally poor, and the second pair of legs, which are usually the longest, function as “feelers” as they walk around, like a blind person tapping a cane. After hatching, a harvestman grows through usually 6 instars (molts) before maturity. Males and females copulate directly, instead of passing a spermatophore (sperm sack) from male to female (which most spiders do). Although it is usually the females that defend the fertilized eggs, in some species the males do so. Depending on species and temperature, the eggs can hatch within a month or can take up to 6 months to hatch. Some species reproduce without males (through parthenogenesis). People have different reactions to daddy longlegs, which can seem creepy or comic, depending on the viewer’s attitude. In reality, harvestmen do us an important service by cleaning up dung and dead things, which most of us would agree are disagreeable. Most cultures see them in a positive light. Harvestmen have several ways to escape predators. In addition to emitting a foul-smelling odor, they can play dead like an opossum. If a leg falls off in a scuffle, the leg can continue to twitch, distracting a predator so the harvestman can flee (some lizards have tails that detach easily and work the same way).